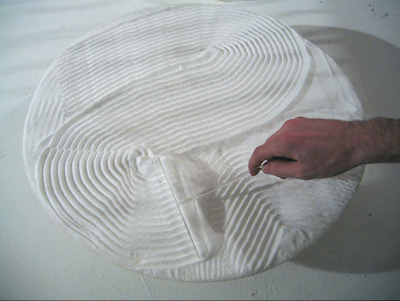 In 2004, "dry-humor" design group Droog created a project encouraging the "luxury' in slowness. "You have entered the space. Our staff has friendly welcomed you. They offer you a map. Choose a drink and a bite. Pay at the counter. You will receive a beautiful napkin. Maybe you have to wait. You can play with the Lucky Cat. When it’s your turn, you take on the big felt slippers. These slippers make you walk slowly and polish the floor. You pick up a chair from the wall. Or relax in one of the rocking chairs and massage your feet. You can also sit down at the low salt tables. You can rake your own Zen garden. Read the embroidered texts. Watch the lights become slowly brighter. Feel that the lights are becoming warmer. Fold your napkin. Wait for your consumption. Experience the preparation of food and drinks. Watch the senior people who flew in for this occasion. Their service is slow but attentive. Watch the people in the space. Enjoy their company. Make friends. When the servants bring you a hot towel, it’s time to leave, so that other people can enjoy a slow experience. If you have taken a chair from the wall please hang it back. Pack the cups in your napkin. Take it home. ... Enjoy."